The month of August is an important month for Singapore as its National Day falls on the 9th of August annually. This year is Singapore's 45th birthday, and it was a particularly happy occasion as Singapore came out strongly from the global recession with a double digit GDP growth for the quarter and the year looks bullish for a strong economic performance. 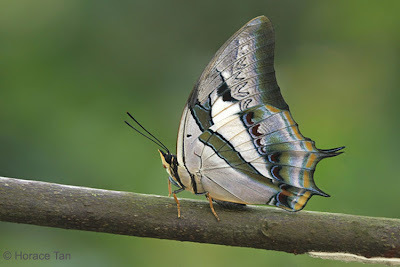 Other than a few days of the exceptionally rainy weather spilling over from July, the month was beginning to show some signs of the waning "Sumatras" as the intermonsoon winds begin to shift. The inaugural Youth Olympic Games - the first in the games' history, is being held in Singapore from 14 - 26 August as some 5,000 athletes aged between 14 and 18 years, will take part in 26 sporting events. 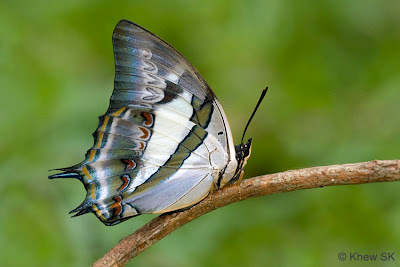 Our feature butterfly this month, is the majestic and awesome Charaxinae, the Blue Nawab (Polyura schreiber tisamenus). This proud and magnificent butterfly can be described as moderately rare, although it has been spotted with regularity in Singapore - more so than in neighbouring Malaysia. The Blue Nawab is the less often encountered of the two Polyura species found in Singapore. 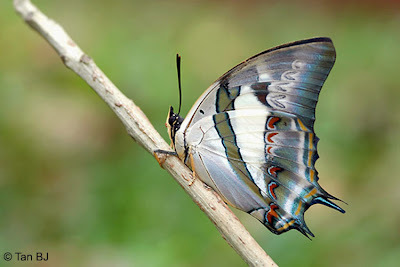 It is a strong flyer like the Plain Nawab and prefers to remain at high levels. 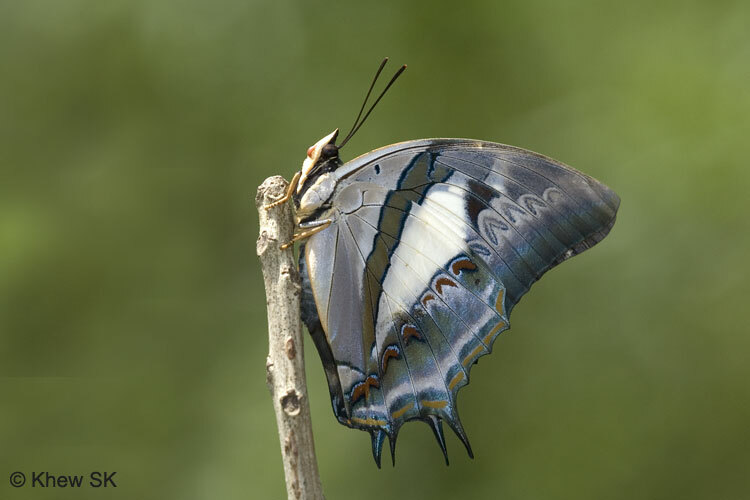 The Blue Nawab has been found in urban parks and gardens, forested areas and also within mangrove areas. 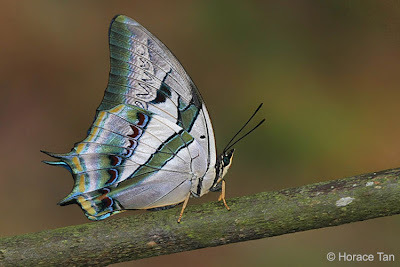 The males of the species have been observed feeding on decomposing animal matter but are also attracted to overripe fruits. 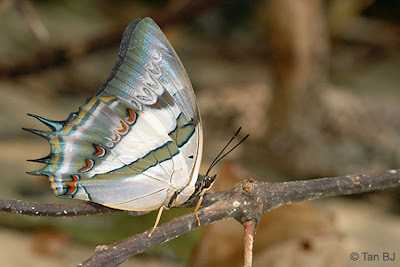 The Blue Nawab has a silvery underside marked with brown and purple patterns. 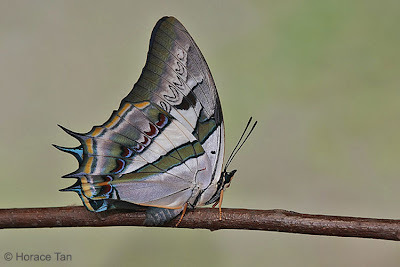 The upperside has a white median band ornamented with blue. 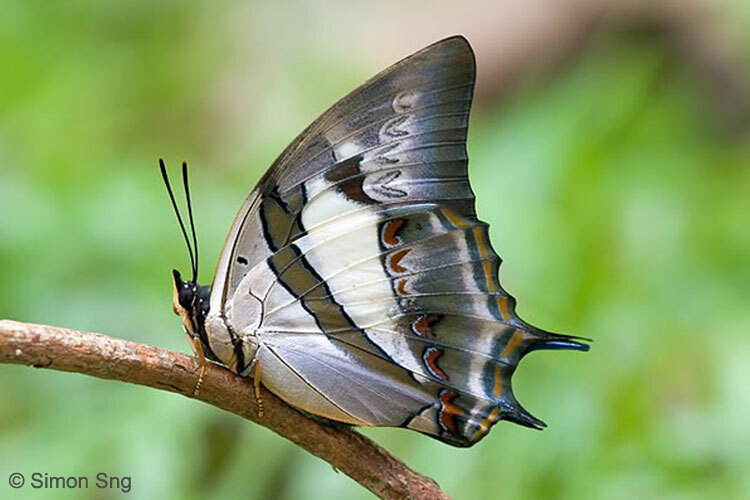 It possesses two pairs of tails on the hindwings. The female of the species is usually larger often attaining a wingspan of 80mm, with broader and longer tails. 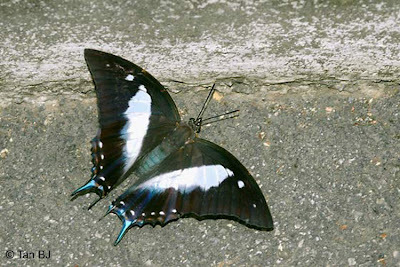 The species has a robust body, and like a typical Nymphalidae, has only four fully-developed legs for walking. The forelegs appear more brush-like and are not used for walking. The butterfly is usually very skittish, and can fly powerfully for long periods of time. Unless one encounters a recently-eclosed individual or in a feeding mood, photographing the Blue Nawab is often a challenge. 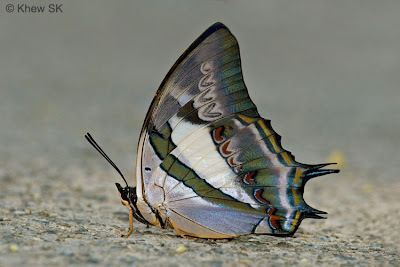 Unlike the Plain Nawab, the Blue Nawab does not display territorial behaviour where it perches on a few favourite spots and returns to those spots time and again after chasing away intruders. Where observed, the Blue Nawabs are almost always in full flight, as if in a hurry to go somewhere. 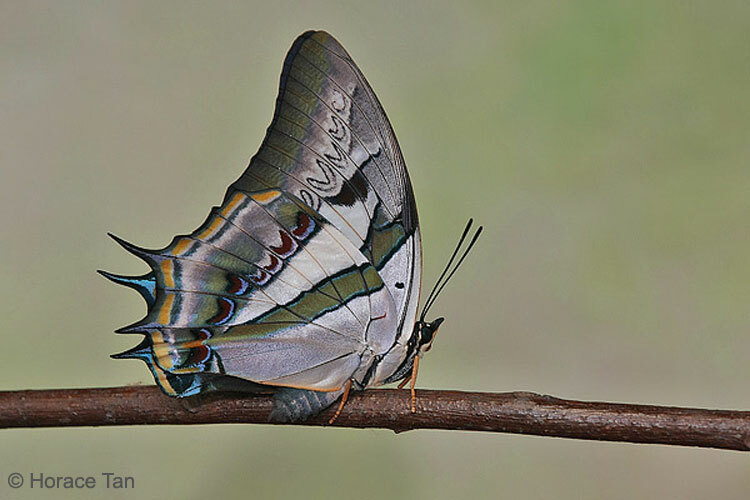 The caterpillar of the Blue Nawab has been found and bred successfully on a variety of plants. Amongst these are Acacia auriculiformis, Adenanthera pavonina, Chorisia speciosa, Nephelium lappaceum, Bauhinia kockiana and another unidentified plant. Hence it is quite interesting that the caterpillars can feed on so many common plants, and yet the species is not as common as it should be.